From prehistoric times in Finland there were two indigenous peoples—the Finns and the Saami—and both developed rich shamanic traditions. At the same time, the documentation regarding Finnish shamanism is fragmentary and the subject of various debates. This is much less the case for the Saami, who in contrast to the Finns maintained their original shamanism well into the historical period when it was more easily and completely documented. Where conclusive evidence is lacking on particular points, the following account of the shamanism of the Finns will rely on the informed opinions of influential scholars. One area of considerable agreement among scholars is that the Finns and Saami have continuously settled Finland since at least 9,000 B.C. (Julku, 2002; Makkay, 2003; Niskanen, 2002; Nuñez, 2002; Saukkonen, 2000; and Wiik, 2006). The large icecaps of the Würm glaciation covering much of Europe in 23,000 B.C. began to recede in10,000 B.C. 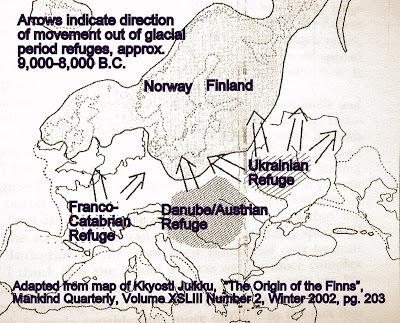 During the long glaciation period European population groups had clustered in three large refuges: the Franco-Catabrian, the Danube/Austrian, and the Ukrainian. 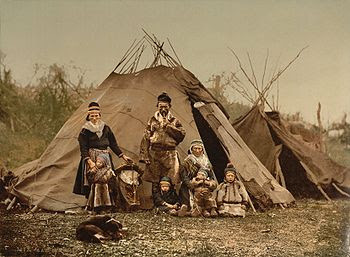 The Proto-Saami people originated in the Franco-Catabrian Refuge. In 9,000 B.C., and perhaps even as early as 13,000 B.C., they moved northward, pursuing deer north across the dry North Sea bottom between the British Isles and Denmark and up the ice-free coast of Norway. About 8,000 B.C. the melting of the icecap progressed sufficiently for them to travel as far south as the Baltic Sea, where they encountered the Proto-Finns. During the millennium or more of their northern refuge they likely had contacts in various directions and developed a shamanistic culture closely resembling those of other peoples of the pan-Arctic zone, e.g., the Inuit of Canada. 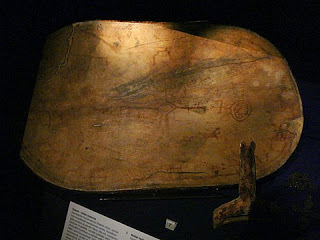 Below is an ancient Saami shaman drum in the collection of the National Museum of Finland. 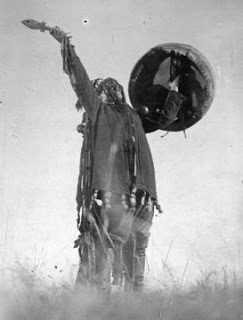 In southern Finland the Proto-Finns developed a shamanic hunting-gathering-fishing culture very similar to those of peoples across the sub-Arctic Eurasian forest zone, exemplified in the classic shamanism of the Evenks of Siberia. An Evenk shaman from the early modern period is pictured below. The shamanic complex in common across the sub-arctic forest zone included a soul which can move freely outside the body, the alliance of shamans with helper-spirits, the ability to shape-shift, and the journey to the Otherworld while in a trace state. (Siikala, 2002b). The Proto-Saami and Proto-Finnic peoples came into contact in the Neolithic period and joined together in the Comb-Ceramic Culture (5,000-3,200 B.C.) that had diffused from the east to the Baltic Sea area. A reconstruction of the type of settlement characteristic of the Comb-Ceramic people is pictured below. The shamanic heritage of the Comb-Ceramic Culture is on display in their rock paintings, of which there are currently more than 100 identified sites in Finland. 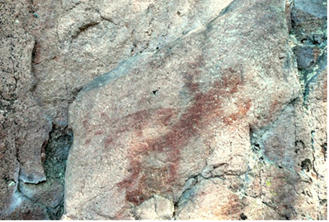 The rock painting below is from Juusjarvi Lake near Helsinki. It is thought to depict a shaman falling into trance accompanied by a fish spirit helper, possibly a pike. The Finns and Saami began to diverge as distinct ethnic groups at the end of the Comb Ceramic period in 3,200 B.C., speaking Finno-Ugric languages. 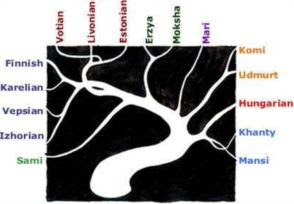 Other Finno-Ugric ethnicities and languages that emerged at this time included those of the Estonians, Karelians, and Hungarians. Beginning about the year 3,200 B.C. the Indo-European Cord-Ceramic and Boat-Axe Cultures arrived in the Baltic area, including Finland. They brought with them pre-Germanic linguistic and cultural influences and early agricultural practices. 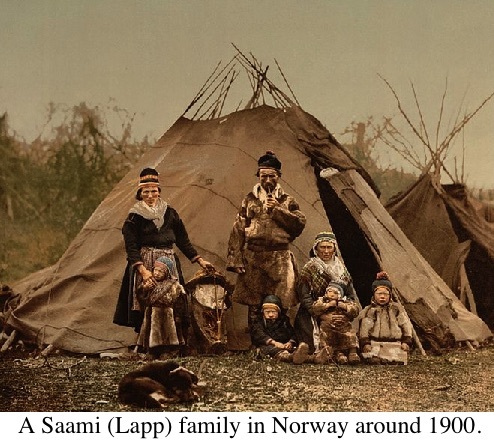 The Saami maintained their distinctive shamanic practices based on a hunter-gatherer subsistence mode relatively unchanged from the Bronze Age (dating from 1500 B.C.) until the 19th century, when churches had confiscated the last of their sacred drums. 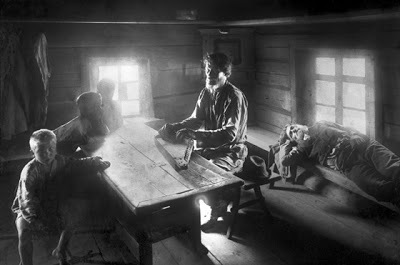 There is evidence that Finns periodically consulted on and borrowed from Saami shamanic practices and implements across that entire span of time. Even today the Saami maintain an active shamanic culture with clear links to their ancient practices. 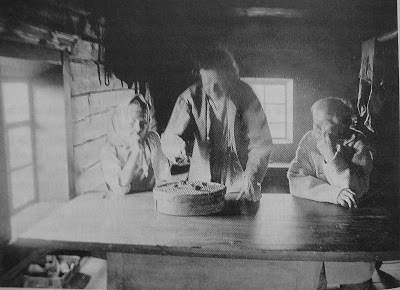 The following is a picture of a Saami family in Norway in 1900. During the Bronze Age and especially the Iron Age there began to arise among the Finns a new type of religious specialist suited to an increasingly settled agricultural people: the tietäjä (literally “knower” or “sage”). Gradually this new practitioner replaced the noita of an earlier era. A principal difference between this practitioner and the noita was in the multiple roles and specializations the tietäjä took on in the new more complex proto-agricultural society: healer, diviner, judge, name-giver, and spokesperson. 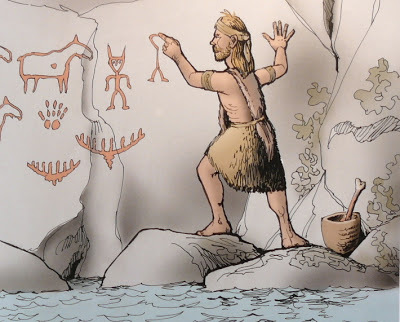 As well, rather than relying solely on shamanic trance journeys to Otherworld spirit helpers as in earlier times, the tietäjä also used the singing of runes to achieve altered states and promote healing and other objectives. Runes are magic songs or incantations in a distinctive poetic metre, some of which preserve themes of the pre-historic shamanic Finnish past. According to Dubois, at least some of the magic incantations may owe their composition to the early noitas. From the Bronze Age well into the 19th century runes were passed down orally in a continuous folk tradition. Among the runes are epic poems detailing the exploits of shamanic figures from prehistory such as Väinämöinen and Ilmarinen. In the 18th century many of these epic poems and magic incantations were collected by Elias Lönnrot and others. 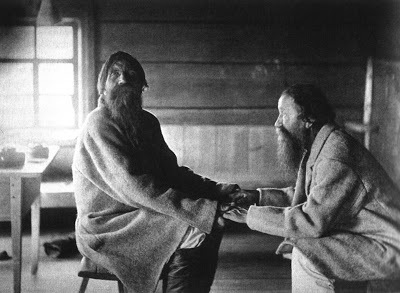 Their sources were tietäjäs as well traditional rune singers who had memorized large numbers of the poems and performed them at in private and at public occasions in tandem, as pictured below. Lönnrot published a selection of the runes in a synthesized form in the national epic, the Kalevala. In addition to the shaman’s drum, tietäjäs used the wooden stringed instrument similar to a zither, called a kantele, which also dates from the Bronze age, to achieve shamanic altered states. The following photo of a kantele being played is by I.K. Inha from 1894. 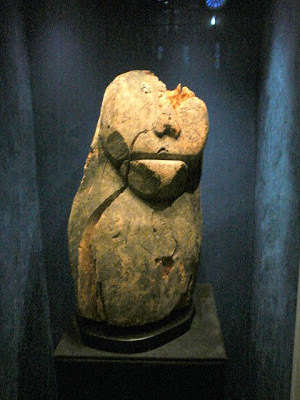 The wooden statue below from the collection of the National Museum of Finland is of a fish god from the Lake Ladoga region. 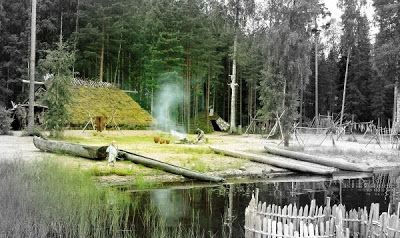 Owing to rural isolation and lack of penetration by the church, the tradition of tietäjäs as seers and diviners persisted relatively unchanged for millennia in the Savo region of Finland. The 1894 photo by I.K. Inha (Siikala, 2002a) shows a Savo tietäjä using the movement of objects on a sieve as a means of divination, recalling both the shape of the shamanic drum used in earlier times by Finns and the well-known drum divination technique of the Saami. 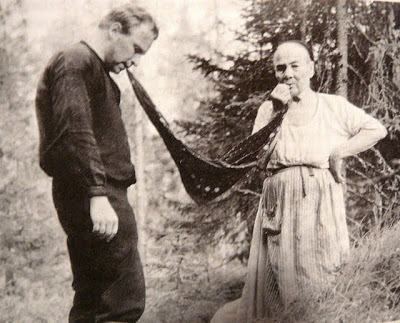 Despite centuries of hostility from the Catholic and Lutheran Churches, (witch trials, destruction of texts and sacred sites such as sacred groves, banning of rune singing) the tietäjä tradition continued as late as into the mid-20th century in some rural areas of Finland. Today, several organizations and a number of individuals continue to practice and support the shaman/noita/tietäjä tradition in Finland. Their work will be the subject of future posts on Spirit Boat. Some people had come to Canada already trained in these skills. For example, one individual near Sudbury was direct heir and former apprentice of Kyyran Jussi, a famous tietäjä in Finland. Others had learned the skills from other immigrants, relatives or friends. Salo says that in general, the tietäjä tradition was embraced by those who were already familiar with it in Finland, generally first generation immigrants. He notes that there was considerably less interest in the practices among second and third generation Finnish-Canadians, suggesting that today nearly 40 years later, probably few remnants of the original tradition still exist. Leppä (Harold Alden) resides in Toronto, Ontario, Canada. Shamanism, Buddhism, astronomy, paleontology. His blog Spirit Boat – Exploring Finnish shamanism.